No faces. No names. No specifics. 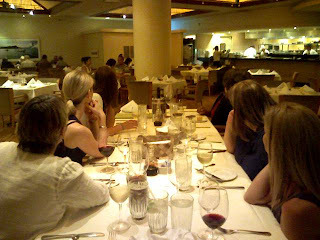 What happens when an author finds herself at dinner at a table full of agents and editors? Presenting at a conference is great fun and an opportunity to learn about the publishing business. I felt caught in the middle. I had writers pulling my sleeve on one side asking me what the secret was and agents and editors on the other side telling me they were looking. Looking for a great writer, a great story teller, a great story. They were looking. Editors reiterated: FIND AN AGENT. They really REALLY really want agented authors. It's so much easier. Well they are not looking to reject you. It's just that this business is so subjective. It may be written well, it may be a great idea but the agent or editor doesn't feel it's for them. This business is full of rejection and full of regrets. But there's no hard feelings and no regrets on my part. I found the agent I was meant to have. The Phenomenal. The AMAZING. THE MAGICAL Dorian Karchmar of William Morris Agency. Writers query their stuff too early. Writers don't revise enough. They get in a hurry. It may have taken you ten years to finish your space opera opus - it takes nearly as long to revise it. The author Ann Hood told me (Knitting Circle, Comfort) her editor has often said that there are many novels she would have bought if they had been revised just one more time. Many of the writers who attended the retreat thought their work was ready. At the end of the retreat they realized that it wasn't. When you're so close to your story it's hard to see the holes. And if a kind of story just doesn't sell? Well, Steve Berry was told that conspiracy novels were so over in the '90's. And then the Da Vinci Code hit and, well, the rest is history. All his novels were published and became best sellers. All of this has been said before. All of this I have heard. I think it hits home a bit more when you see the earnestness, the sincerity, in their faces. They DO NOT want to reject you. They need writers who write. Writers who can finish one book and then another and another. Writers who revise, revise and revise some more. Writers who learn grammar and syntax and read and read and read. Writers who know the business or take the time to learn. I must tell you, Tooloose was very upset. I didn't allow him to come and bring his manuscript and pitch it. He's just not ready. You ask him what his book is a bout and 15 minutes of meows later you still have no clue. I told him he needed a two sentence pitch. And then if that wasn't enough Sarah Rees Brennan and her agent Kristin Nelson. We did alcohol high above the Honolulu lights. It was a stimulating and mind blowing week. My brain is full of what I must do. Now I will be chatting with agents and editors socially and learning more about the business end of publishing. I'm sorry. I just couldn't take it. I had to check into the hotel. HERE IS WHAT I AM NOT DOING. The signs are all there. The wild hair from pulling. The bags under the eyes from late night typing. I laughed. I cried. I took notes. His advise? JUST DO IT! My teacher Gary Braver did his talk about the 10 basic ingredients of a thriller that I think applies to plotting any book. His advice? Kick it up a knotch. Make your character's lives miserable. And then do it some more. Touloose I understand that life is more than cat food and a clean litter box. I had to devote this time to my art. I'm sure you will understand some day. Wednesday Ann Hood talked about the 10 things you need to do to get published (actually I counted and there were at least 13). We definitely got our money's worth. So now after six days? People's work is really taking shape. We're a cohesive group and have really bonded. Well I really got some help on the voice of my next character. I'm ready to get immersed in my story. So Touloose. Thanks for understanding and taking care of ORION. I have been remiss. The WINNER of the personalized paperback of LOTTERY was HEIDI. I sent it off and she should have it by this time - She now has permission to gloat! He passed out contracts and schedules and said to make a binding agreement with yourself to write every single day. The talk this afternoon was with the two Ann(e)s about setting and using all the senses to show the reader where your world is. ANNE LECLAIRE and ANN HOOD. So afterward I went out to dinner and talked writing all night. Now I'm home. I had to let Tooloose know what I learned. Tooloose is working on his own book. "Letting the Cat Out of the Bag: A Memoir"
If it's written down it must be true. So another early morning arrival at the retreat. This time to hear STEVE BERRY talk about REJECTION!!! Yes folks it's true. Get used to it. Rejection is your friend. Rejections come when hunting for an agent, when submitting novels to publishers, when submitting proposals to editors. Rejections come when a reader or reviewer doesn't like your book. Embrace rejection. Be one with rejection. Rejection is love. Okay so maybe I went a little far. But Steve's point was that it's part of the process. Tooloose says that he deals with rejection all the time. It made him a better cat. So in homeroom we read our first chapter aloud and then everyone critiqued it. We are to take the comments and incorporate them into a re-write. So what am I doing blogging? I DON'T KNOW!!!!!!! And then after our homeroom session we listened to the phenomenal JACQUELYN MITCHARD talk about dialogue and how it shouldn't just be an info dump or preaching. She talked about how dialogue written in books is not exactly how we speak (Tooloose says I say WAY too many ums uhs ers and meows). Oh. The best thing? Jackie gave us ALL permission to eavesdrop. Everywhere. With everybody. One photo is of our homeroom and the other is where Ella's boat is usually docked. She is out in the Pacific Ocean cruising. From Kauai to Niihau and back. Just like these writers. Putting herself out there. Just like these writers. Taking a chance and flying in the wind. My favorite part of retreats and conferences is meeting people. This is Carolyn and Robert. After getting my Starbucks I attended a talk by WILLIAM MARTIN on Tapping the Source of your Creativity. What was fun about his talk is that he uses everything to inspire himself -- setting -- bumperstickers--life threatening injuries. Oh yeah and when you're stuck -- blow something up. In our homerooms (thats what we call classes with our instructors) we all read our synopses to each other and had to tell every one what our stories were about. I guess the point is many times we write our book and we don't have our characters change. We don't have a clear idea of who our story is about and what motivates our characters...Gary said something very cool. He said,"Fiction has to make sense...real life doesn't." I think the coolest thing about his talk was that he'll always at least start a first chapter and wrestle with a new idea and knows when to abandon it and move on to something else. He says there are times he'll take a scene from a defunct idea and insert it into another book. 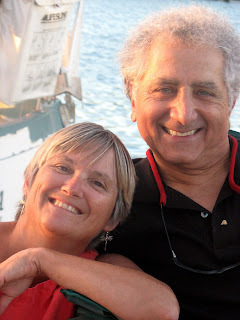 What can I say...I invited my Maui Writers Retreat teacher to dinner on ORION. Photograph taken by Kari Peterson who is NOT a stalker. Okay so maybe I was angling to be teacher's Pet. You can't blame a girl for trying. She is every bit as fun as you might think. Neither of us took a breath. We talked non-stop. The opening ceremonies included an oli or chant by a Hawaiian Kumu (teacher) and a short address by Hawaii Governor Linda Lingle. More gabbing and re connecting with good friends. The phenomenal instructor DR. Steven Taylor Goldsberry. The DREAD overhead about your very first page, choosing a title and an evaluation guide for writing. Which all you writers ought to run right out and order on amazon - it's great. The high points? Here are some of my notes: Find a title that makes people's eyes light up. By the end of the first paragraph on your first page show some sort of conflict. Are your characters interesting right from the get go?Is there white space on the first page? This fools the reader into thinking they could quickly read your beginning- then...HOOK THEM!! I've been a huge advocate of conferences and retreats. It's where you can network, where you can learn and meet agents and editors -- not necessarily to be represented or published -- but to hear them speak and see they are real people with likes and dislikes. It engenders understanding of the process of publishing. It starts tomorrow. I have my laptop ready (I bring it to class). I need more ink for my printer but I have lots of paper for homework assignments. I'm ready to meet blogging buddies who are attending. I've already met my instructor the professor and author Gary Braver. I know he's an award winning thriller writer, but he also teaches commercial fiction writing at Northeastern University in Boston so I'll know I'll learn lots. Why attend a retreat and conference when you are already a published author? That will be the focus of the next several days of posting. Hopefully you'll figure it out by the last day (September 1) when the conference wraps up for 2008. I'll reconnect with agent Jeff Kleinman and meet agent Kristen Nelson among others and hopefully have some sage words of advice to you from them. I'll talk to editors like Neil Nyron and Shaye Areheart. 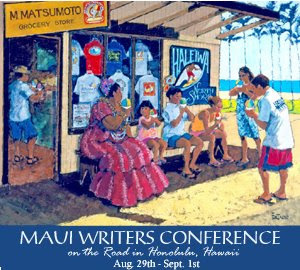 So bloggers check out the Maui site. See what's happening and tell me the people you want to hear from. And questions. Send on your questions. Where did you leave my Jimmy Choos? He's buried deep in a bank. But there's a logical explanation. A hundred years ago the shore was closer. Over time the reef was exposed stranding gastropods who came late to the party. He snoozed he lost and there he remained. High and dry until some geographically challenged beachcomber found him. Pat has no explanation for the shell perched in the tree. She'd like to think it's the next step evolutionarily. In a million or so years. What Pat is looking for? You are alone on ORION with your two cats who are pacing nervously, sensing that something is about to happen. You hear the hoist coming. A rumble. The straps are placed and your boat shakes and groans as she's lifted high into the air. Inside you feel a swinging. You are asea, but not at sea. Over phantom rolling waves. You are carried with your boat into the ways and lowered. The wind picks up and you swing perilously close to the concrete sides of the ways. But you have help. Your buddies from the boatyard. The three Mikes come to help you take ORION home. In marinas everybody is either a Mike or a Bob. This is true. Here is a picture of Mike number three. He is married to Cheryl. There are few Cheryls in a marina so you can refer to him as "the Mike who is married to Cheryl" as opposed to "the Mike who is married to Mary and "the Mike who is married to Carol"
You start the engine, make sure the prop engages, gather the lines, and motor out into the harbor. You notify the harbor with your handheld, "Sailing vessel ORION coming home. Requesting inbound clearance." "This is sailing vessel ORION do you copy?" "Sailing vessel ORION has entered the harbor. Please respond." You realize you do not have the volume of your radio turned up. You dock. Tie her up. Say goodbye to the Mikes. Let your two very angry and retaliatory cats out of the forward cabin. You spend three hours cleaning boatyard dirt off ORION. You connect cable and get your high speed internet for the first time in a week. You feel wonderful. You are no longer sweating. Your hands stop shaking. The rush...the unbelievable rush. You close your eyes in ecstasy... unlimited wireless. The next morning you wake up. Drink your coffee. And stare at this. Pressure wash. Sanding. Well, it could be worse - at least there are no blisters. Great. We got the first coat of paint on. The condition of the propeller is less than ideal, but it could be worse- at least it's useable and can be replaced when we're in the slip and have an extra $2,000 to spend. Yep it could be worse...at least nothing else looks bad. I mean the rudder looks fine doesn't it? oh my she is looking nice. Another two days? Three days? It could be worse...We could have to climb up and down THREE ladders to get in and out of ORION. The last part of the waxing. It could be worse. We could be sunburned over the entire length of our bodies instead of just the back of our legs, shoulders and ears. Thought all my blogger buddies might find it interesting to see what hauling out is like. 7:30 am Orion went into the ways. The trades picked up so we bounced a bit. They placed the slings under her belly and hoisted her up. NOTE: Tooloose and Girl Kitty were in the forward cabin this whole time and none too pleased. I could hear Tooloose yowling from where I was on the ground...The guys were asking, "What is that sound?" This is Lo, the driver of the hoist. He is TOTALLY COOL! Here we are up on the Jacks. Those of you who have read LOTTERY can see now why Keith joked about "being on the hard" and "putting jacks on and off"
How do we get into and out of our boat? Check out the 12 foot ladder to our swim steps off the aft. Ya gotta love the boating life. The girl needs her hull cleaned. I will be in internet withdrawal over the next several days. For my contest? To win an autographed copy of the paperback LOTTERY? The one you all entered about how a galley remodel is like writing a novel? The contest will continue until we get back into the water. I will be able to access my email and that's about it. I plan to get LOTS of writing, stainless cleaning, deck swabbing done. IF I can steal wireless I will blog and post photos of the haul out. Otherwise you'll have to wait for a recap. When is a novel like a galley (kitchen) remodel? This is an interactive site- Bloggers are asked to contribute their ideas in the comments. Will win an AUTOGRAPHED copy of LOTTERY!!! Revisions, revisions, editing, more revisions. Tinker. I wrote a guest blog about book clubs for BOOK REPORTER. If you don't know about this site you should. They have READING GROUP GUIDES and nifty SUMMER BEACH BAG OF BOOKS CONTESTS where you can win your own special copy of Lottery and other cool stuff. I have no idea when my blog will be posted but stay tuned and I'll tell you. Or you can peruse bookreporter.com everyday (which is fun too). Of course he can go home and look at is Pulitzer Prize. I can go home and stare at my unfinished kitchen. Sometimes ya just gotta get done. Tinkering be damned. Forge ahead full speed. Take no prisoners. As I said to my first mate and co-habitator Gordon this past year, "So when is our new galley going to be done?" "I don't know dear. When is your second book going to be finished?"